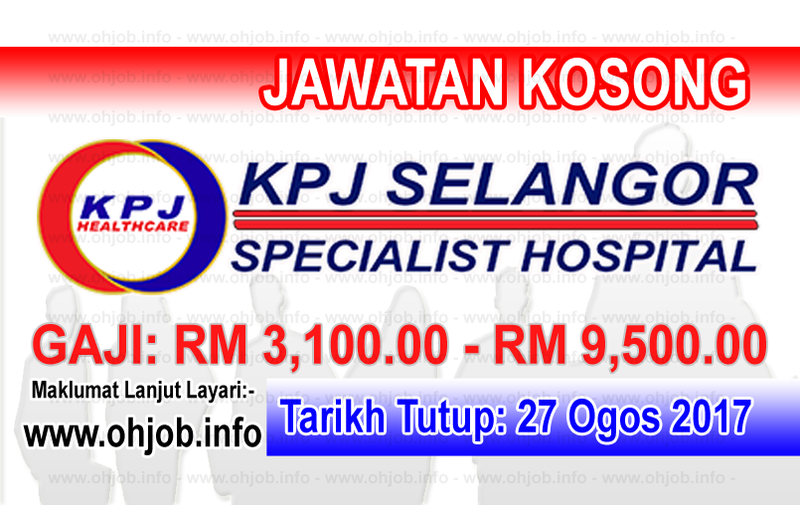 KPJ Selangor Specialist Hospital (KPJ Selangor) is a full-fledged private specialist hospital built in Shah Alam with comprehensive medical and healthcare services serving as a One Stop Health Care Centre. Utilizing the modern technological equipments and supported by a team of Specialists, trained and skilled medical and para-medical personnel, KPJ Selangor provides quality competitive healthcare treatment and services for the residents, businesses and industrial population of Shah Alam, nationwide and worldwide. Terima Kasih Kerana Membaca Dan Menyemak Jawatan Kosong KPJ Selangor Specialist Hospital (27 Ogos 2017) Selamat Memohon Dan Semoga Berjaya Kami Ucapkan, Sila LIKE Facebook Page Kami Dan Kongsikan Kepada Semua.